Crown molding is no longer a symbol of your grandmother’s sense of style. More and more home owners are finding themselves enamored kitchen cabinets decorated with ornate moldings and the tops of their walls decked in uniquely sculpted boarders. If you are thinking about adding crown molding to your home, consider these design tips. The first item to consider is where you would like to add the molding. Some houses contain molding at the base of every room, while other houses feature molding in one or two rooms. What is the flavor of style you are trying to convey? More traditional looks tend to include molding throughout an entire structure, while modern designs are more e\selective with where it is featured. 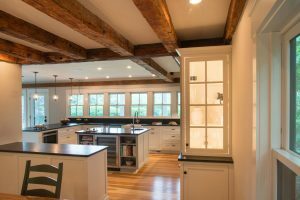 While moldings are traditionally close to the ground, there are some designs where molding is features where the wall meets the ceiling or both. Kitchen cabinet molding is a popular feature among more modern designs. The next item to consider is if crown molding is consistent with existing décor. If you are considering adding molding to the base of your walls in a particular room, for instance, is the base of you walls mostly visible or is it covered by furniture? Are you willing to move furniture to make aesthetic space for your new molding? Lastly, if you are adding molding to your home, make sure that the addition actually adds to the existing design. If your space is lacking a distinct aesthetic, perhaps adding molding is a good idea. If your space seems complete already, be cautious in proceeding with additional molding unless you are trying to achieve a very specific aesthetic. Crown molding can be removed once it is installed, but the removal and readjustment that follows can be costly and time consuming. Make sure the molding serves a specific purpose before installing it. If you’re excited about adding molding to your home designs, do research and get creative. Most importantly, have fun.